Scotland, home to breathtaking scenic rail journeys. If the beautiful country of Scotland has caught your attention, then our selection of rail passes and train tickets will give you the freedom to create your very own Scottish adventure! Offering up a great variety of must-see destinations, include stops in Edinburgh, Glasgow, Inverness, Aberdeen and Stirling, just to name a few. Getting around by train is also a great opportunity to stop off en route to places less traveled; let’s say if you wanted to hike through the Highlands or tour old castles. Known for having some of the most scenic rail journeys out there, we can guarantee that the views stretching through your window will stay with you long after your visit to Scotland has ended. Browse our selection of rail passes to enjoy flexible travel throughout Scotland, around Scotland’s central region or extend your travels to also include Scottish Highlands. Take the Scotland Discovery Ticket and visit over 90 castles, battlefields, monuments and gardens or hop aboard a City Sightseeing bus tour and take in all the sights! 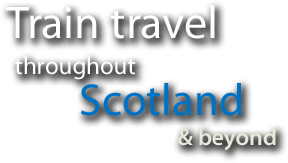 Scotland has many vibrant cities to visit, so simply select your route and travel in comfort to the likes of Edinburgh, Glasgow, Inverness, Aberdeen, Stirling & beyond.